It looks like I haven't been keeping up with these posts. Of course I've been upgrading to every new release as they come out but there really isn't a reason to continue posting. Usually everything is uneventful. 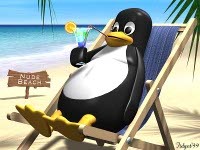 Linux is pretty much mainstream and easy these days. :) I haven't been visiting the forum lately so I didn't realize the forum was so out of date and the guestbook wasn't working. Basher notified me about it. Upgraded phpBB and the guestbook database this morning so things should be running again. Let me know if you have issues.